I had to use my favorite wildflower identification site to ID this flower. I was pretty sure it was a wild rose of some sort, from the leaves, but was not sure of the actual name. There is a ton of this flower around our area. So much so it is kind of a weed. But a pretty one!!! Aren't these known as Ragusa roses? I have some that look like this in my yard. Here in no. coast Mass., we have tons of these wild roses, and they smell so very sweet! 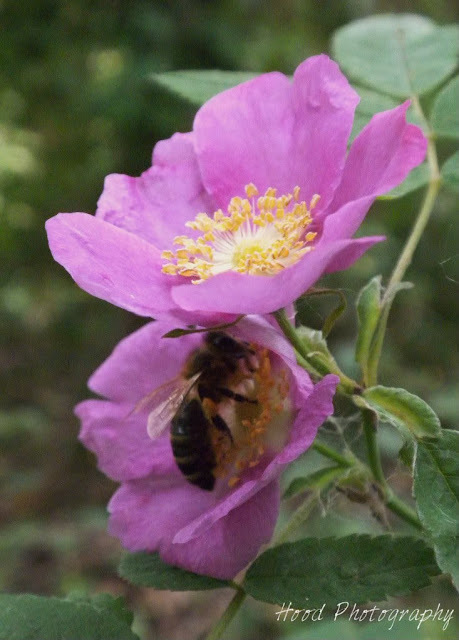 I haven't seen many wild roses since I was a child. Aren't they so lovely? beautiful! and I love the capture of the bee. I'm a great fan of bees and love to see them photographed. I love the dainty petals of wild roses. I had to hop over and visit when I read your title over at Pink Saturday. I just returned home from a week long road trip with 3 of my friends. We stayed at a resort in Welchs, OR and drove the Fruit Loop through Mt. Hood. We visited the mountain and dined at the Timberline Lodge. Your state is gorgeous and we had so much fun. I did 4 posts about our fun trip. Lovely rose! Have a wonderful weekend! Very pretty capture . . . love the smell of these simple beauties. Come on up to Fidalgo, Whidbey and the San Juans. We have them everywhere. Ours are Rosa nutkana. They love to grow on dry banks and bluffs along the beaches.